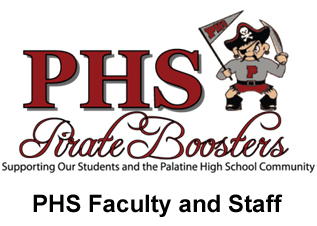 Show Palatine High School your support today by becoming a member of the PHS Pirate Boosters or support our efforts by making a direct donation using the form below. Payment can be made with a credit card or your PayPal account. All payments will be processed through our secure PayPal system. You may also click here for a printable form which you can mail in with a check. Each year, funds raised by PHS Pirate Boosters are given in the form of mini-grants to a wide variety of academic departments and extracurricular programs and services that directly impact the entire student body. Pirate Boosters gave over $113,000 to our PHS Community during the 2017-2018 school year! Past recipients of mini-grants include: Applied Technology, Art, Athletics, Band, Commit to the Pirate, English, Family & Consumer Sciences, Halloween Trick or Treat, Media, Music, Palatine’s Promise, Physical Education, Science, Social Studies and Student Services. We also award scholarships to 13 graduating seniors who personify our mission to strengthen the PHS community, as well as the Palatine community at-large. Throughout the year, we support our students by volunteering to plan and chaperone events including student social activities, sports awards nights, and post-prom festivities. Events and fundraising plans are already underway for the 2018-2019 school year, but they cannot be successful without your help. Your membership is a major source of funding and critical to our success! Please help support these efforts by joining PHS Pirate Boosters! If you have any questions, please email Membership@PHSPirateBoosters.com. Membership materials will be available for pick up (and purchase) onsite at the Pirate Booster Booth in the stadium parking lot during home varsity football games starting with the Red & White Football game on August 17th. Materials can also be picked up at Open House (August 30th).